I live in NJ so i would select ND-TX? that tracker needs to be updated with the new long month system. Are these dates accurate for 2014 ? And how do you enter your state if you can't download the file ? Is there a file I can download to check my state & dates ? It's all listed in the master C* thread. Why do you need a spreadsheet to calculate the date for you? I'm lost. This has really changed over the years. Before one service was good, files didn't get chopped or anything extreme. 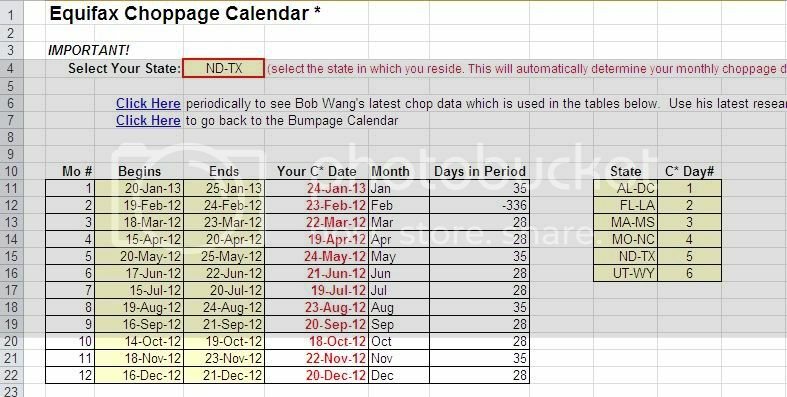 Hi.. Every time I try & change the dates, I get an error message saying to make sure chop calendar contains current dates..
Click on the Choppage tab at the bottom of the spreadsheet and update the dates in that table first. Right now I have 20/3/12 HI on my EX/EQ/TU, and I have CCMD ($12.95/month one). Do I just pull daily forever, so new HI will all be bumped off after 80-85 days for EQ and 56 for TU? Or do I pull for 3 months, stop, and repeat again in a year or two when I need to? So, this doesn't account for the chop date for 2015 or is it irrelevant of year? you have to put the dates in yourself. Tried that but having some issues. So, chopapge date for MD is tomorrow? the 13th? Midnight? it's all in the B* spreadsheet.